Forget power cuts, ‘Ache din’ are here for the Indian sports fan. Over the next few weeks, the world will be tied into football fever. We will be dazzled by the artistry of a Messi and Ronaldo; fans in Kolkata will wear Brazilian shirts; pubs in Mumbai will have special screenings; and life in Goa and Kerala will revolve around a ball. We will celebrate the spirit of the beautiful game even as the national team won’t be playing it yet again. In the 84-year history of the event, we have not participated in the World Cup finals even once. We almost did in 1950, coincidentally also hosted by Brazil, but had to withdraw because we were not allowed to play barefoot. The 1950s and early 60s are perhaps the golden age of Indian soccer: We won the gold at the inaugural Asian Games in 1951, repeated our success in 1962, and finished fourth in the Melbourne Olympics in 1956. Recent years have been sadly more difficult for the Indian football team. We are ranked 154th in the world (Pakistan is ranked 169th, which may provide consolation to some); we lost the South Asian football title last year to Afghanistan and even struggled to beat tiny Maldives. While another pint sized country like Honduras will participate in the World Cup, our best hope of actually being in the finals may lie in hosting the tournament one day. Ironically, there is some evidence to suggest that interest in the sport itself has never been higher. Television ratings of global football games, especially the English Premier League, are steadily climbing. There is, in fact, more ‘live’ football now than ever before on Indian television. The inter-club tournament is being supplemented by an IPL style football league later this year. The World Inter-club tournament will be hosted by India in 2017 as will a global junior tournament. The sport has also moved beyond its traditional powerhouses — West Bengal, Kerala and Goa — and discovered fresh catchment areas. Nowhere is the craze for football more visible than in the North-East. 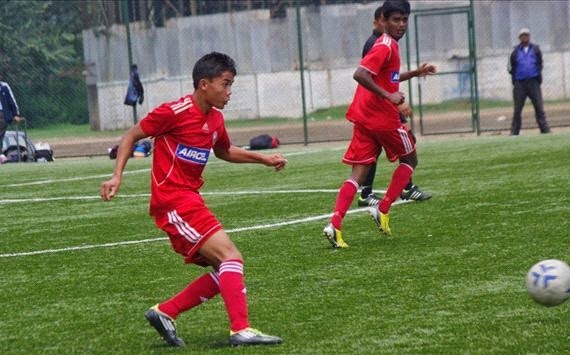 Mizoram, quite remarkably, won the national Santosh Trophy this year; clubs like Lajong FC in Shillong have made a mark in top events; and Baichung Bhutia has stirred a football mini-revolution in his home state of Sikkim. And yet, why is the glass of Indian football so painfully half-empty? Why is the world’s only genuine mass game unable to take a great leap forward among the wider masses in the country? The obvious answer must lie in our near-fatal obsession with cricket. When one sport so overwhelmingly dominates our lives, then what chance for any other sport to survive and prosper? Our original national game, hockey, has already been pushed to the margins, so what hope did football, not blessed with the same golden traditions, ever have? Cricket monopolises talent, resources and attention, leaving us perilously close to being seen as a one-sport nation, although recent successes in the Olympics in individual sports like shooting, badminton and wrestling have offered some respite. And yet, to blame cricket for the woes of other Indian sports is self-defeating. The fact is, games like football have wallowed in mediocrity for much too long. Kolkatans, for example, have remained content in the battles between Mohun Bagan and East Bengal, almost mirroring the plight of a state being left behind by the rest. Kerala too never looked to raise the bar of the sport. Is it merely a coincidence that the Left, which has often looked at sport as an elite luxury, ruled Kerala and Bengal for years? The solution doesn’t lie in simply getting more foreign players to participate in domestic leagues. Nor will it change by bringing IPL-style glamour into the sport with the likes of Ranbir Kapoor and John Abraham now owning football teams. It won’t change by merely showing more of the sport on television either. In fact, the telecast of global football leagues only underscores the difference between the rest of the world and us. The key to the future then is two-fold. First, we need to recognise that football requires special physical attributes that are ill-suited to many parts of the country. What countries like Japan and South Korea have shown though is that raw power alone doesn’t win you football games; there is space for speed and quick reflexes. The footballers of the North-East are uniquely blessed in this regard. A focussed programme of football academies and world-class training aimed at this part of the country will have the most direct impact on our football. If Haryana could throw up India’s wrestling heroes, why can’t the North-East produce an assembly line of quality footballers? And why can’t business houses take this up as a challenge and part of corporate social responsibility for an oft-neglected region? The other long-term solution lies in simply giving our children a chance to play. Per capita playgrounds in this country are among the lowest in the world. We shrink open spaces in our cities and have schools without sports grounds, and yet expect to produce international athletes. Cricket is an exception because there is an eco-system that now rewards excellence; for the rest, there is little chance of growth without infrastructure. In Mumbai, for example, the Shiv Sena has now proposed to convert the 225 acre Race Course in the heart of the city into a theme park. The idea isn’t bad: A city like Mumbai needs more green lungs for its common citizens to enjoy rather than retain it as a privilege for Turf Club members. A space for people to walk, and maybe for our children to just kick a ball, isn’t that a way to a healthier and more ‘sporty’ future? Post-script: Since the football World Cup doesn’t evoke the nationalist passions that cricket does, I am, like many Goans, seeking refuge in our colonial past. Portugal and Brazil are my teams for the Cup! To launch by quite the first line of my statement – I do approximating to bestow associate tremendous as a results of world wide diary title. terribly it's associate Brobdingnagian work by him that I discovered associate dependable facilitate by his/her nice info instant auto title loan. I just envy to tell, delight sustain it up your work. typically i ready to|i'll} be ready to ensure in conjunction at the facet of your posting and alter. endeavouring ahead to your a allotment of mails.